Franz Xaver Gruber had worked as a teaching assistant for his former teacher Peterlechner in Hochburg: This educational background was sufficient for him to be able to apply for teaching examinations in Ried im Innkreis. The school was opened in Ried in 1780 as the previously Bavarian teaching staff had to be retrained to the Austrian Theresian schooling system following the new border divisions. This is where Franz Xaver Gruber received his certificate on 22 July 1806 for having completed his examinations. Beginning with the second half of the 18th century, the Innviertel region was at the centre of various competing power interests. The fertile, around 2,200 square-kilometre-large stretch of land switched back and forth between Bavarian, Austrian and — for a short time — even French rule. In 1779, the Innviertel region, which had been Bavarian until then, fell to Austria as a result of the Treaty of Teschen, then fell back to Bavaria for a brief period of time from 1810 to 1816 and finally made its way back into Austrian Hands thanks to the Treaty of Munich. Ried im Innkreis is located at the heart of the Innviertel region. 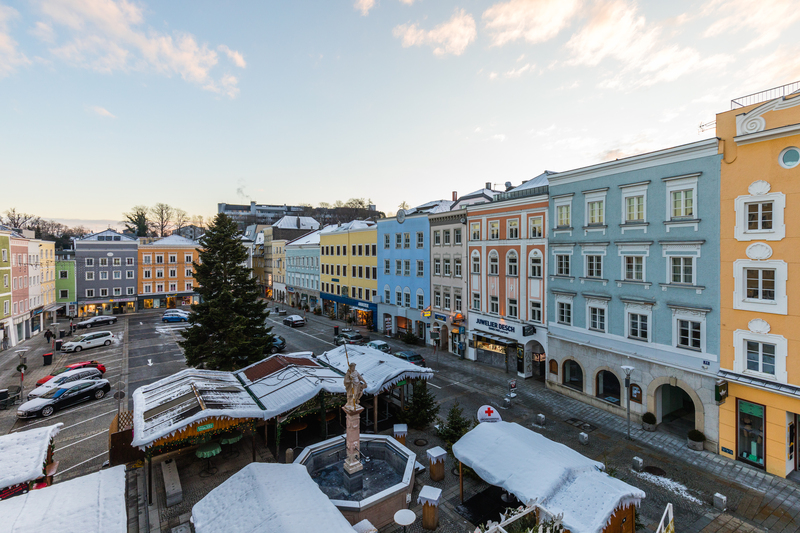 In 1857, Joseph I of Austria officially declared what was at the time Austria’s biggest market a city. 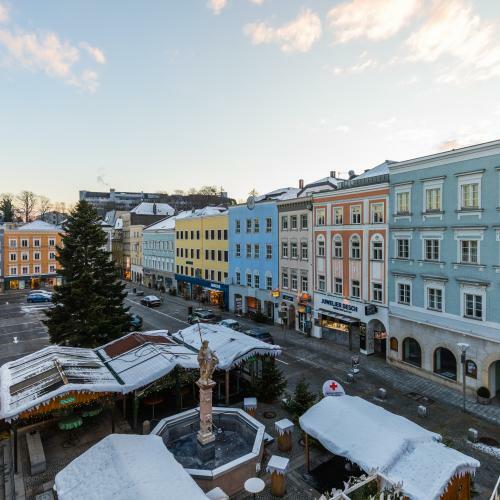 Today, around 12,000 people live in Ried. Ried has been artistically influenced by the Schwanthaler sculptor family for nearly two centuries. Hans Schwabenthaler, the dynasty’s forefather, came to Ried in 1632 from the region around Altötting. Hans Schwabenthaler’s son Thomas built on his father’s knowledge. He trained with Italian masters and started calling himself Schwanthaler beginning in 1679. In 1707, the remarkable Baroque sculptor died aged 73. The career of Johann Peter, Thomas’ grandson, began in Bavaria, and the Innviertel region was then handed over to Austria in 1779. Four family members worked as sculptors at the same time, but the times were starting to change. At the beginning of the 19th century, many artists left the Innviertel region and headed for Munich. This also included the Schwanthaler family, which was able to work and create again in the new environment. There, Ludwig Michael Schwanthaler created the famed Bavaria statue, as well as the Mozart Memorial, located today on the Mozartplatz square. 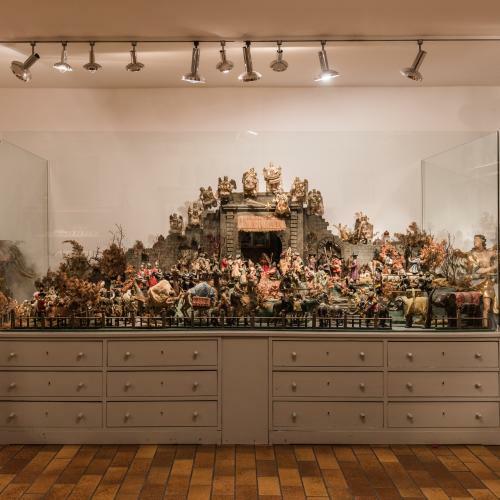 The story of Oberndorf’s Nativity Scene, in front of which Gruber and Mohr sang “Silent Night” for the first time, also took some unexpected turns. After several detours, it eventually ended up in the Innviertler Volkskundehaus Museum in Ried and counts among the collection’s highlights today. Following the demolition of the St. Nikola Church in Oberndorf between 1906 and 1913, the Nativity Scene was not transferred to the new church but instead gifted to Oberndorf’s school nurses. During financially desperate times, they sold it to a merchant who in turn sold it to Pastor Johann Veichtlbauer from St. Pantaleon. The Nativity Scene finally ended up with the rest of his collection as a gift to Ried. 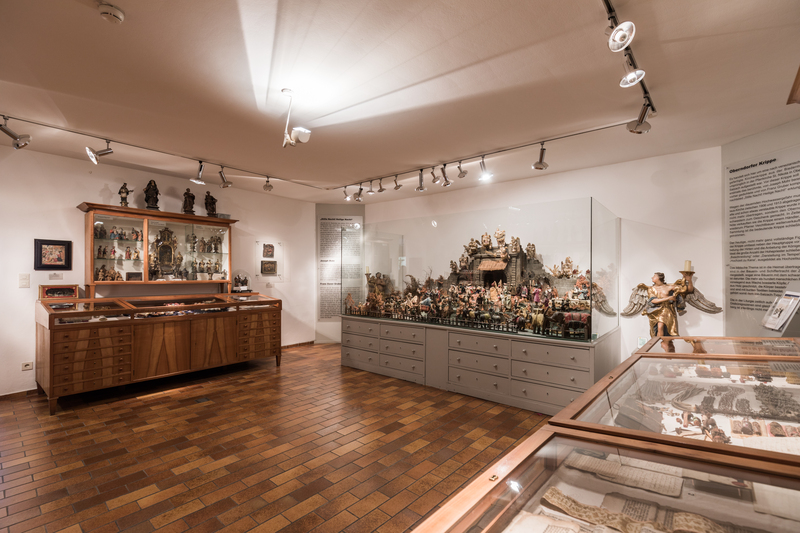 The Innviertler Volkskundehaus Museum at the Kirchplatz square contains the original Silent Night Nativity Scene from the St. Nikola Church in Oberndorf. 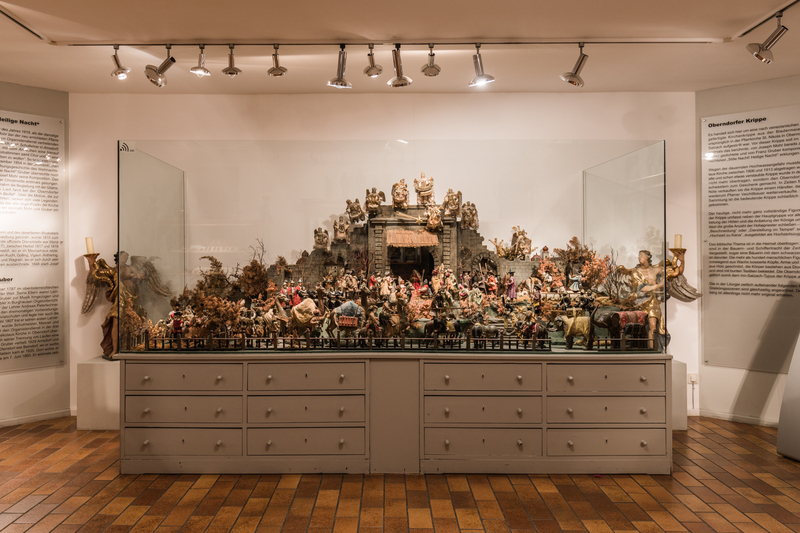 The Nativity Scene was made following Venetian examples around 1800 and includes figures typical for the Inn-Salzach region. The biblical scenes were translated into local happenings as was common at the time. The shepherds wore traditional farmer’s and mariner’s garments, a female farmer with a black headscarf can also be seen. The heads of the more than one hundred human figures are mainly made of wax, the arms and legs of wood and the body of wire mesh. 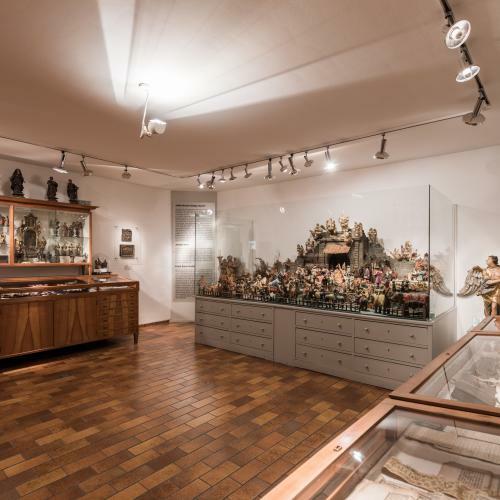 With its excellent collection, the Volkskundehaus Museum also provides a fantastic overview of the various shapes and forms created by the Schwanthaler sculptors. A town walk through Ried im Innkreis begins at the Volkskundehaus Museum at the Kirchplatz square. The route follows the Kirchengasse on the right side until you get to a small passage way leading to the Main Square. The Dietmarbrunnen well separates the square. Passing by the formerly Gothic town hall, you turn left to the House at Hautplatz no. 10. Underneath an oriel, you will find a rare fresco, depicting two jesters embracing one another with the caption: “Unser sein Drey” (We are three). Is the person looking up the third jester? What will definitely be revealed when looking up is the room in which Emperor Napoleon stayed. At the end of the upper part of the Main Square, the town walk forks off to the left towards Stelzhamerplatz square. In house no. 10, Franz Xaver Gruber received his teaching certificate. The Schwanthalergasse branches off to the left, where the family of artists originally lived. A memorial with the portraits of the three most significant Schwanthaler family members was added in 1868. The walk’s highlight is the town’s St. Peter and Paul Parish Church. The carved pieces of the interior design are largely a result of the work of the Schwanthaler family. An impressive example of the family’s skill is the biblical scene in the Elendkapelle chapel, attributed to Thomas Schwanthaler.